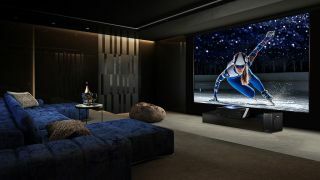 Announced at CES 2019, Hisense Australia has revealed that it will bring its gargantuan 100-inch laser TV to local market sometime in the first half of this year. Using ultra short-throw projector technology, the Hisense L10E is able to project a 100-inch image onto a lightweight screen from a distance of only 19cm. Described as a '4K Dual Colour laser TV', the television's X-Fusion Laser Light Engine combines two laser diodes – one red and one blue – to display beautiful HDR10 colours, along with sharper image quality. Hisense's Laser TV is also able to deliver fast motion images and high refresh rates thanks to its built-in MEMC Technology with microsecond processor response, making it ideal for gaming and sports-watching. In terms of sound, the Laser TV's projector console delivers JBL Cinema Sound via its 14 built-in speakers (powered by dbx-tv audio enhancement technology) and an additional wireless subwoofer for room-shaking bass. Of course, the 100-inch Laser TV will include a built-in TV tuner, along with access to hundreds of smart TV apps, including Netflix, Stan and YouTube. At present, Hisense has yet to announce Australian pricing or availability for its 100-inch Laser TV, though don't expect it to be cheap – on Hisense's US retail site, the 100-inch L10E is priced at US$9,999.99 (around AUD$14,044) . Thankfully, customers in metropolitan areas will be able to save some cash by receiving Hisense's 'Premium White Glove installation service' as part of their purchase.